The Portus Project is committed to providing an educational environment informed by its research strategy. 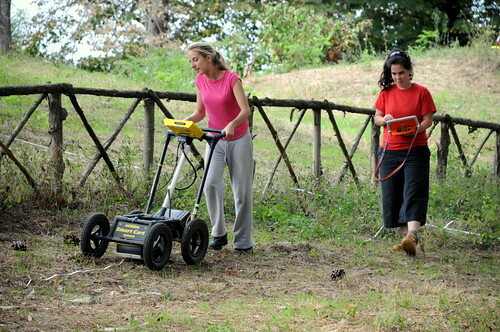 We have trained undergraduate, masters and doctoral students in on site methods and post-excavation. These students come from all of the partner institutions and from further afield, including students from Europe, North and South America, Africa, Asia and Australasia. We have also had volunteers from outside the university system. Students have and continue to use our material as part of their studies, including many undergraduate and masters dissertations and projects, and involvement in approximately ten PhD projects so far. In our most recent stage of the Portus educational strategy we are building on the infrastructure provided by our research funding to create a novel multidisciplinary field school that will be accessible to students from all disciplinary backgrounds. This reflects our commitment to multidisciplinary research already reflected in Portus project activities, bridging electronics and computer science, ocean and earth science, geography, psychology, engineering, art and the humanities. We provide a range of options for studying within the Portus Project. If you would like to be kept up to date about any of these options please sign up for the Portus Project Newsletter. Those with a general interest in archaeology and the site of Portus who would like to gain a sense of what archaeological education at Southampton offers will be able to participate on-line in our Portus MOOC (Massive Open Online Course) as of spring 2014. This will be produced in partnership with FutureLearn. 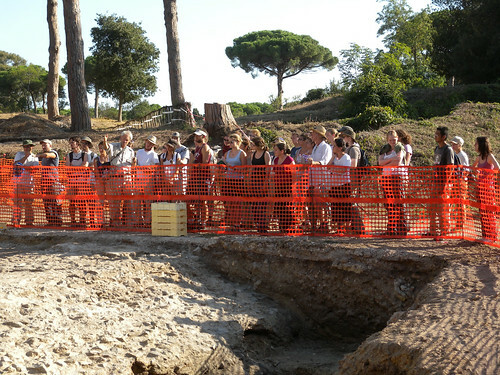 Anyone may also apply to participate in the Portus Field School on site in summer 2014. This process is administered via a Lifelong Learning course open to all. Learn more and apply for the 2014 Field School here. If you study undergraduate archaeology at Southampton you have the opportunity to attend the Portus Field School in summer 2014. If you are studying another undergraduate degree programme at Southampton you can participate in the Portus Field School by registering on our Portus Curriculum Innovation module. If you are an experienced postgraduate archaeologist or bring other relevant skills we may offer discounted places via a Graduate Internship on the Portus Field School. Please contact the Fieldschool Director Dr Dragana Mladenovic for details. These various activities all interconnect. So for example, students participating in the Portus Field School are strongly encouraged to participate in the MOOC. This will provide all participants with an introduction to the site and also bridge the learning experience between those physically learning on site and those participating virtually through a variety of means. Read more about our Educational activities at Portus via the Education tag and watch a video here by the Director of the Portus Project Simon Keay about Portus and educational opportunities. We hope that whether you participate in the project remotely as a MOOC student or work on site via the Portus Field School that you will enjoy the interdisciplinary opportunities it has to offer. Get in touch with Dr Dragana Mladenovic (D.Mladenovic@soton.ac.uk), the Field School Director to find out more.